The last time we heard from the illustrious trio of Espen Aalberg (on percussion), Jonas Kullhammar (on saxophone and flute), and Torbjörn Zetterberg (on double bass) was in 2014, when they released Basement Sessions Vol. 3 (The Ljubljana Tapes) - that recording featured the inimitable tenor saxophonist Jørgen Mathisen, whose powerful and driving style meshed well with what the Clean Feed website refers to as the “mutated hard-bop” of the core trio. Like that previous release, Vol. 4 finds the group teaming up with a fellow explorer of jazz’s past, present, and (possible) future: the endlessly prolific Susana Santos Silva. Santos Silva has built up a considerable discography over the past few years, with albums like Life and Other Storms and Impermanence serving to draw ever more attention to her formidable compositional prowess. 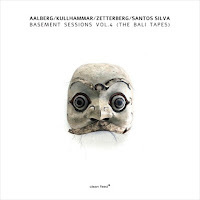 While Aalberg is the author of the five pieces on The Bali Tapes, it is nevertheless an exciting prospect to hear the ways in which Santos Silva augments and interacts with the hard-hitting style that the Aalberg/Kulhammar/Zetterber trio have cultivated in their five years together. “Slow Ostinato” begins with tentative stutters from Kulhammar and Santos Silva and an evocative wash of cymbals from Aalberg - and for four minutes, the group engages in a sparse exchange, with the Kulhammar’s saxophone and Santos Silva’s trumpet wandering through various timbral permutations and tonal manipulations. It’s curiously hypnotic, moreso because of the somber and resonant shades of gamelan percussion that gradually rise to the surface. Yes, being in Bali, the quartet availed themselves of the opportunity to perform with the various mallets and drums that comprise the island’s most well-known traditional music. In the latter half of the piece, Santos Silva and bassist Zetterberg construct a sonorous, yet simple, thread of rhythms with the gamelan, while Aalberg’s patterns become increasingly complex. “Dewas Dance” marries the rich melodiousness of the gamelan (once again, from Zetterberg) with Aalberg’s driving, rock-inflected rhythms, and the result is a joyful mash-up of sorts. As the title suggests, the piece is centered around a pulsating, toe-tapping beat, and, in the same way that traditional gamelan relies on repetition for its shimmering, moving-while-standing-still effects, “Dewas Dance” hinges on countless restatements of the main “theme,” with occasional eruptions into a more conventional head. Atop all of that repetition, Kulhammar and Santos Silva take turns, snaking their way through solos that run the gamut from hot, to blistering, to just plain feverish. The opening of “Ilir Ilir” recalls Jimmy Garrison’s work with late-period Coltrane, with Zetterberg taking a break from the gamelan to engage in a (much too brief) minute of soloing that serves to immerse the listener into the ethereal and otherworldly atmosphere that hangs about the track. The spare and abstract clusters that Aalberg coaxes from the gamelan mallets only increase the narcotizing effect of the piece, and when he transitions into loose, indefinite drum-work near the six-minute mark, far from solidying the piece’s dreamy abstractions, it makes them all the more transfixing. That same dream-like quality is carried over to “Irama Berat,” but here it acts as something of an undercurrent that wafts just below Aalberg’s strutting, mid-tempo cadences and Kulhammar’s near-frenzied shrieks. “Suling,” the final piece, opens with deep, gong-like intonations, a curious rustle of percussion that almost sounds like running water, and somber, twin incantations from Santos Silva and Kulhammar. As the tempo picks up, those latter two diverge, with Kulhammar going on to offer a series of susurrations that, considering the mirage-like quality of the track, sound more like half-murmured chants than the notes from a saxophone. While previous volumes of the trio’s Basement Sessions have had their fair share of surprises, Vol. 4 is, by far, the most adventurous; sure, there are times here when it would have been nice to hear the rollicking, upbeat sound that the group developed on previous outings, and the high-energy playfulness of “Dewas Dance” had me longing for more fleshed-out takes on its gamelan-infused hard-bop. Nevertheless, Vol. 4 is rife with exploratory structures, idiosyncratic instrumentation, and entrancing rhythms that reveal the remarkable range of the Aalberg/Kulhammar/Zetterberg trio. At times transportive, at times irresistably rousing, Basement Sessions Vol. 4 (The Bali Tapes) is a fine example of jazz’s ability to not only recreate emotional states and moods, but to send you to new, as yet unknown places.